This is one of those times when I’ve run clear out of steam, and words. I’ve got myself in a flummox. I got a new camera but it’s not a popular kind and I’m having a hard time figuring it out. I got it on the home shopping network, which I normally love for purchasing things (not that many things from there but always OK), however, this camera is very strange. It’s probably not the right one for me but I don’t send things back so I’m stuck trying to figure out the easiest way to use the thing. I think I have it set to “auto” so it doesn’t require me to fiddle with any settings, but it seems that every time I take a picture with it, something different happens. Oh, and I have a recipe/tip for you. It’s very simple and I did it last night and oh-my-oh-my, it worked so well. I had thawed out two boneless skinless chicken breasts for our supper. I wasn’t sure what I was going to do with them all day. Then, very near suppertime, I was watching The Pioneer Woman cooking show and got this little recipe from Ree Drummond, the hostess of that show. She was making a big batch of chicken legs (with bone in and skin on) so basically I was taking a chance that it would work with my naked breasts (chicken, that is). She melted butter in a pan on the stove and stirred in to that some minced garlic and juice of some lemons. Then she added some cayenne pepper. Here is her site with this recipe on it. Heat up the butter, garlic powder, lemon juice, and paprika til it’s all combined. Dip each piece of chicken into the pan and get it all soaked with the butter mixture. Lay each piece onto a cookie sheet lined in aluminum foil. Brush the chicken pieces again with the mixture but leave a little bit. Then shake some bread crumbs over the tops of the chicken pieces, and then pour the remainder butter mixture over the breaded pieces. Bake in a 375 F oven for 30 minutes. You will not believe how great this tastes! The chicken is so moist and the lemon juice in there is really great. So easy, too. I love it when I find a technique that is simple and easy and really gives you a great flavor. This one does it. Bland old chicken breasts will never be bland again. 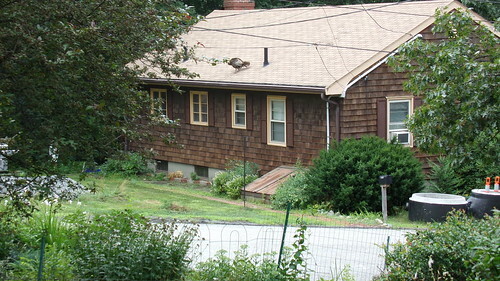 Here’s a picture I’ll leave you with that I took with my new camera the other day – look closely now, or you’ll miss the wild turkey on the roof! LOL! to Reenie’s poultry post comment! Well, this turned into a poultry post! Love the chicken recipe for its yummy simplicity and the turkey shot is a riot! I can’t bake in the summer. Makes the house hotter, well the kitchen anyway. I still haven’t figured out a way to use my oven without bending. 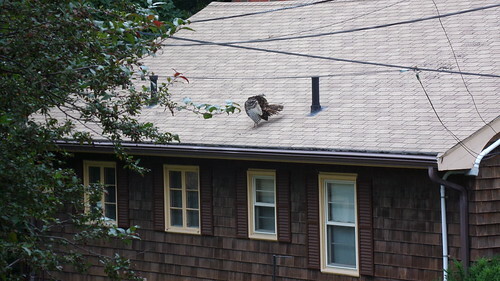 You don’t often see the turkeys on the roofs around here but they can fly. I have caught them flying out of our yard and over the fence when they get caught inside and the dogs are let out.